​Bodie Hodge, Author and Speaker from Answers in Genesis, joins us to discuss his new book, A Flood of Evidence, and shares about some upcoming expansions to the world-famous Ark Encounter! Audible - Get a FREE audiobook download and start your 30 day free trial today from Audible (an Amazon company). Over 180,000 titles to choose from for your iPhone, Android, Kindle or MP3 player. You help to support this show when signing up at http://www.WitnessTalkRadio.org/Audible so show that support and sign up now! Bodie Hodge is a speaker, writer, and researcher at Answers in Genesis. He’s recently co-authored “A Flood of Evidence” with Ken Ham to answer some of the top questions about Noah’s Flood. Bodie has a master’s degree in Mechanical Engineering and has been teaching apologetics to teens and adults for years. Would you like a free copy of the new book, “A Flood of Evidence,” signed by Bodie and Ken Ham? 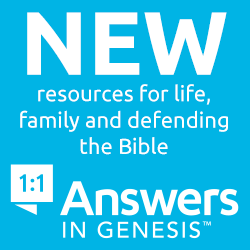 This giveaway is over, but you can still buy the book and other great resources from Answers in Genesis.